The Minnesota-plated RV rolls steadily on the highway toward Wisconsin. Accompanied by other RVs, campers, motorcycles, and trucks trailing boats, there wouldn’t be any reason to think this particular vehicle is unique in its weekend commute. 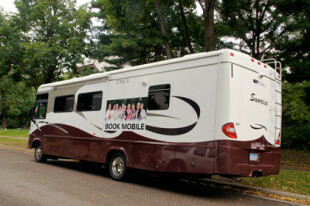 That is until you notice a poster-sized photo of ten women holding a book and the RV’s name, “Book Mobile,” centered on the side. Those pictured women are the chatty occupants excitedly anticipating the upcoming weekend. They talk about the parts of their lives they regularly share and occasionally reference the book and geography into which they have purposefully planned to immerse themselves for this month’s book group discussion. 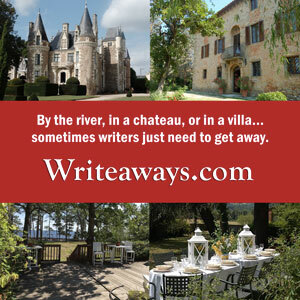 It is a “lit trip” and one of the memorable book group experiences that inspired author Terri Peterson Smith to write Off the Beaten Page: The Best Trips for Lit Lovers, Book Clubs, and Girls on Getaways. 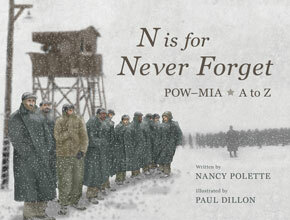 People join book groups in hopes that discussion of the books they read will enhance the reading experience. There is also an element of relationship-building that exists with most book groups. Take a book group and add in a road trip, or a visit to a place mentioned in the book, or a walk through the setting that inspired the author, and suddenly the experience of book discussion and relationship-building has a whole new layer. The Wisconsin road trip Terri’s group took led the women to a member’s lake home to discuss Wallace Stegner’s book Crossing to Safety. 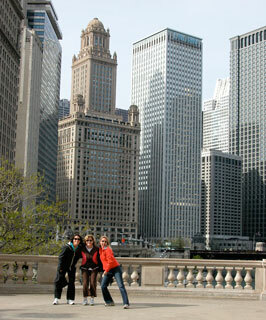 Terri joins book club gals on a lit-trip to Chicago. The new level of experience was so inspiring to Terri, she took on the daunting task of providing ideas for itineraries and an extensive list of titles for fifteen spots across the United States. She wanted her love of books and travel to come together in a meaningful way. She provides ideas for the short day trip as well as what might need to happen for a more extensive travel plan. Book groups were the intended audience, but Terri has found that other groups of people are tapping into her resource. In Cape Girardeau, Missouri, the travel bureau is excited about the book Gone Girl by Gillian Flynn and the potential for readers of the book to build trips around that destination. Besides visitor bureaus that recognize the potential around literary travel, other groups of people are finding value in planning trips with books in mind. Literary travel can certainly enhance the book-reading experience while growing relationships, but it is also possible to use books to enhance the travel experience as well. Appropriately, Off the Beaten Page begins in Boston and travels from east to west, ending in Santa Monica, California. 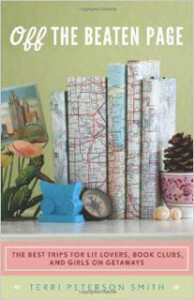 In order to write the book, Terri went to each city with the specific intention of seeking out ideas for itineraries appropriate for group travel. There is a possibility Terri will pursue other versions of Off the Beaten Page. Terri hopes readers of her book will discover that no matter whether they read fiction or nonfiction books about the places they travel, they will have greatly enhanced experiences.